Home / Articles / The End of the World? There is a fascinating link between history and the astronomical movements in our solar system, in particular to the planetary cycles. How convincing is the evidence? And what does this imply for the times in which we live? An apocalyptical (revelational) study. The American Public Religion Research Institute recently published the results of research into the American population’s expectations for the future. The survey showed that half the population was of the opinion that “recent natural disasters (caused by global warming or climate change) is a sign of the Apocalypse – the End of the World – the Last Days as predicted by John of Patmos in his Book of Revelations.” Among the Afro-American Protestants and white Evangelical Protestants who participated in the survey, three-quarters of them shared this view. That is a massive number of individuals. Looking back to the early 80’s, I can remember a similar survey. At that time it seemed 90% of the bible-belt inhabitants in the U.S.A. believed that they were living in the Last Days. At that time too there was crisis, just as there is now. Nevertheless, it is important to question these ciphers. In a new PRRI survey it seems that in reality the participants were more concerned about issues such as unemployment, income inequality, health care, debt and immigration, than about climate change. Last year ‘De Correspondent’ (a Dutch digital newspaper established by the philosopher and former editor of NRC Next, Rob Wijnberg) published the results of several critical studies on the validity of recent scientific publications. It was found that up to 90% of them failed critical review. They did not meet current scientific criteria. A clear example of this is the present climate debate. All the satellites that have continuously measured the temperature of the troposphere worldwide since 1979 show that the highest mean mondial temperature occurred simultaneously with the El Nino of 1998 and that since then the temperature has remained quite stable, in contrast to the alarming predictions published in subsequent IPCC reports. On the scale of a human life, climate change is a local event, subject to various cycles about which we are continually learning more. For example, set against the melting of the ice on the North Pole, an increase in ice formation on the Antarctic has been observed. Worldwide this reveals a very slow warming up, in sharp contrast to alarming messages published in the media. Newton said 2060 was the earliest possible date the apocalypse could arrive: “ It was meant to counter other calculations that predicted a sooner end of the world. It’s not that he thought it was instructive to calculate the date; he thought it was very destructive, because if it didn’t come through, people would lose their faith in the Bible and in prophecy. This sounds sensible, considering that he was living in a time in which Christianity was dominant. That God’s plans were unfathomable was for Newton a fact and he spend many years studying the bible in the hope of discovering an occult roadmap. In the meanwhile we are 3 centuries further and find ourselves in the middle of a revolutionary phase in space research, led and supported by an almost permanent revolution in physics. Metaphysics appears to have been swallowed up by physics and it is now physicists who are providing more information about life’s beginnings than holy scriptures. 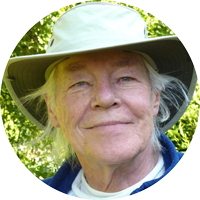 But there is a large but… Some years ago a respected astronomer and physicist confided in me that he could no longer follow all the developments in physics. He could understand the basic theories but groused about the experimental character of many of them. He mentioned this briefly, but if this was true for him, what can we as interested laymen hope to understand? Yes, we can study mathematics, as this is the language in which physicists communicate. But is there no other language in which reality can be described? Yes, there is indeed an alternative, and it too is in a revolutionary phase. This is the language of time, not in the poetic, but in the factual sense, as we generally acknowledge that the measurement of time depends on astronomical factors. The grammar of this language is therefore astronomical. This includes not only our concept of time as recorded by our clocks and calendars but also, as we look further into the cosmos (as humans have done for thousands of years with increasing success), there is an astounding amount of knowledge and insight to be gained. However, even though knowledge automatically leads to an expansion of consciousness, how far does it take us? With each progressive step the illusive horizon shifts further away and beyond still lies an ever greater mystery, seemingly shrouded forever. The above graph is composed on the basis of the Neptune-Pluto cycles. 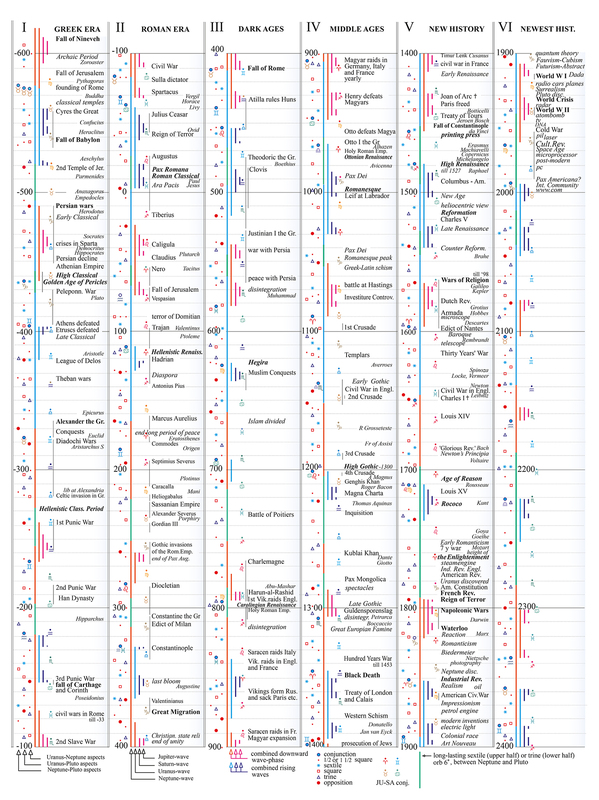 In this graph you see 6 timelines, each showing 500 years with the relevant conjunctions, oppositions and prolonged harmonious aspects. From conjunction to conjunction is called a synodic period. That of NE-PL lasts about 493 years. 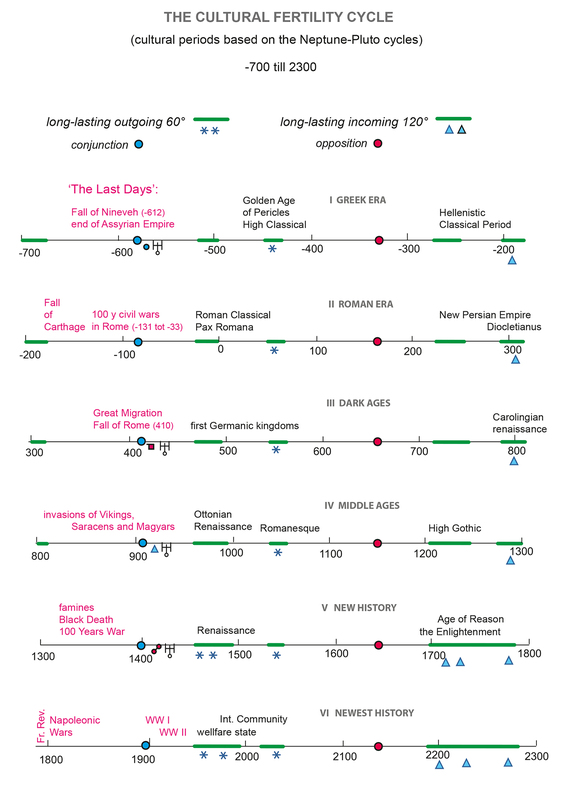 Interestingly enough, the traditional time-scale in which historians classify the past is in periods of 500 years. Viewed superficially, this could just be a curious coincidence but first let’s plunge into the depths of this ocean called history. The reason I begin this study in 600 BC is because in the 6th Century BC a triple conjunction occurred between Uranus, Neptune and Pluto (UR, NE & PL). After 8 NE-PL cycles, almost 4000 years later, this reoccurs. Especially interesting is that in the 6th Century B.C., classical civilization began. This is in a European perspective, but it is relevant to other cultures as well. The scenario of the heavens shows all NE-PL cycles to be almost identical. The human players have given differing interpretations every 500 years to the same dramatic line. This surpasses a Greek tragedy in a dramatical sense, a recurring theme of death and rebirth of culture and civilization. This is but one cycle, one planetary wave. While this forms the basis, the keynote, it is often lost under the overtones of other, subsequent, planetary cycles. The composition of the above graph is precise, a millimeter work. For further detail see figure 4. “But how many readers are familiar with both history and astronomy?” queried Paul Kluwer, the editor of Ankh Hermes Publications when, in 1986, I first showed him the manuscript of my book ‘Golven’ (Waves). Even so, the good man did publish it. Now I also feel the need to refer to the whole of recorded history but instead I refer you to an earlier article of mine, ‘The Inner Power of the Imagination‘, also based on the NE-PL cycle. This I wrote in 1990/91, in response to a request by Charles Harvey, in a series of 4 articles for the Astrological Journal. Together they form a summarized version of my book Golven i.e.Waves (1986) and a useful introduction. 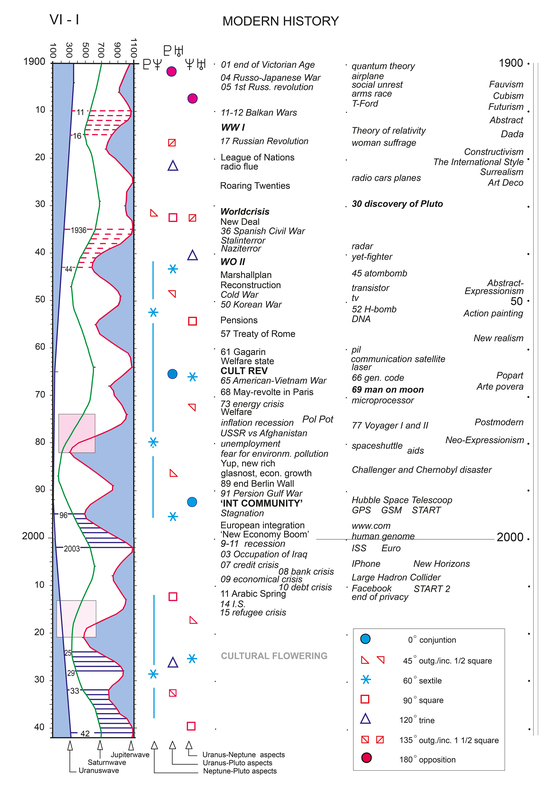 As mentioned earlier and illustrated in the above graph, each NE-PL cycle begins with a conjunction (marked by a blue dot) and ends with the following conjunction, almost 500 years later. Having considered all the Pluto-Neptune cycles since the 6th century B.C., I have been able to ascertain that in the phase occurring between the prolonged waning trine and prolonged waxing sextile (the last time was between the Reign of Terror in 1793 and the turning-point in the Second World War, towards the end of 1942), the culture as such finds itself in a continuous process of disintegration. 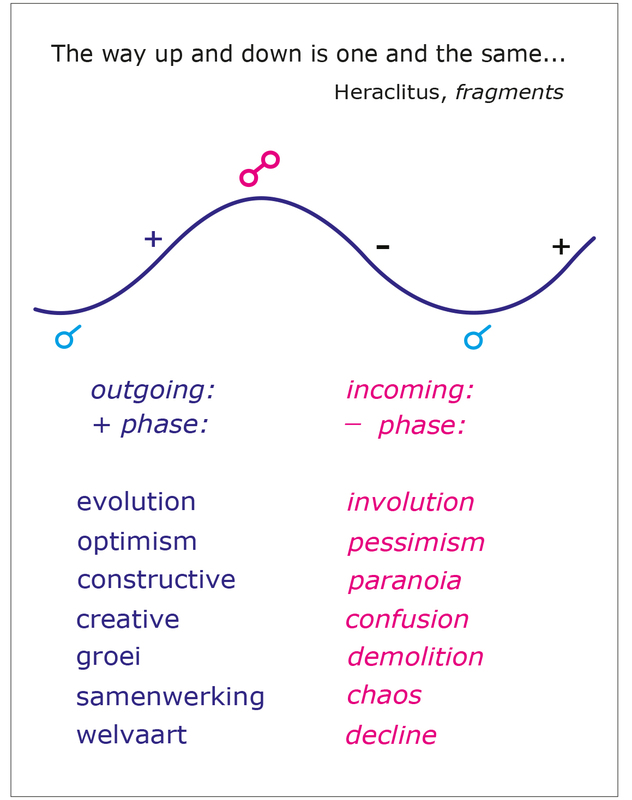 There are sometimes local exceptions and the cycles of Uranus can have a strengthening or weakening influence on this process, but the general picture remains: the culture is in a permanent state of decomposition. And, as far as any signs of cultural flowering do arise, these tend to be of the more superficial kind (‘The Gay Nineties’ and ‘The Roaring Twenties’). This is clearly illustrated in this graph. The ‘funeral’ phase, the ‘end’, is at the beginning of each line, to keep the graph compact. It is titled ‘The Last Days’, in red, so that it stands out. The ‘Four Horsemen of the Apocalypse’ appear 6 times within the time-frame of this graph… each time followed by a ‘green light’, a period of bloom that ushers in a new cultural-historic period of 500 years. ‘Size doesn’t matter’ comes to our mind. The reason for such dominance of the NE-PL cycle over our universal history has often puzzled me. It was several decades ago that I first started research to find the answer and, in consequence, created the graph below, figure 3. 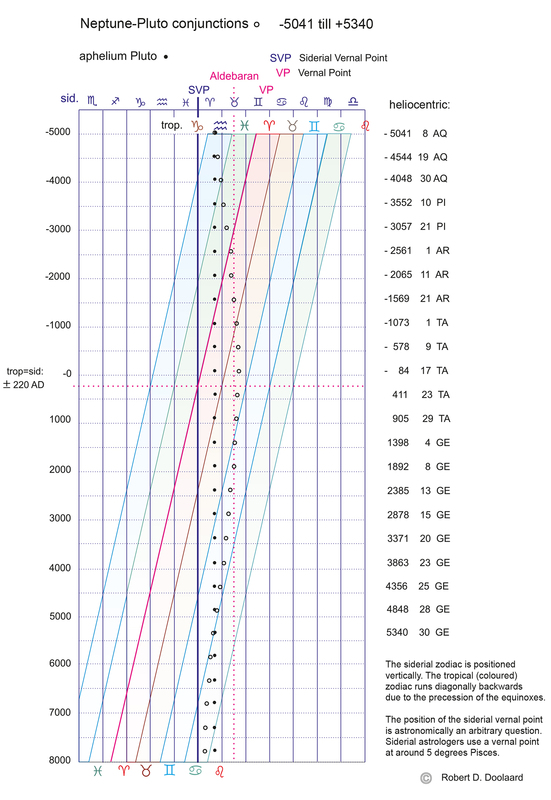 At the top of this graph there are two horizontal rows of zodiac signs. The lower one (the tropical one, in colour) is used to determine the longitude of a planet. Astrologers have classified these in a notation of 12 x 30 degrees, of which every 30 degrees was named after the sidereal constellation that you see at the top of the graph. In fact the precession of the equinoxes results in an increasing distance between the tropical and sidereal zodiac. Astronomers, like astrologers, use the tropical zodiac but in the less poetic notation of 24 hours of 60 mins each hour. We owe both systems to the Babylonians. 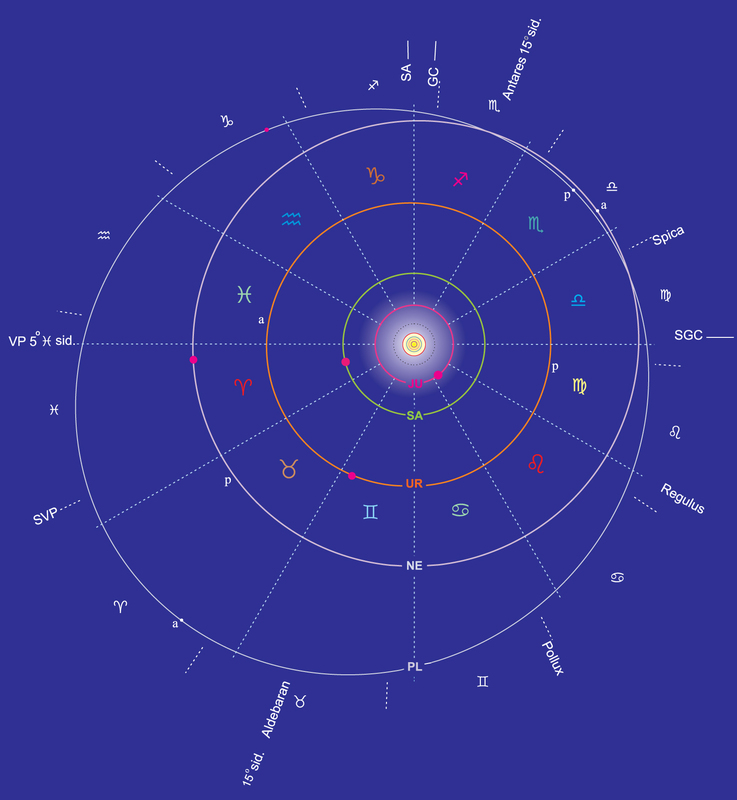 A preference for the tropical notations is due to the impossibility to determine a beginning and ending point of the zodiac. Astronomically there is no reason for this, although here science (nature) stands opposite to astrology (culture), Natura Artis Magistra, not vice-versa! And while astrologers make grateful use of science, unfortunately scientists seldom show any interest in astrology. The graph below illustrates that the conjunctions (in longitude) of NE and PL always occur in the proximity of the aphelium of Pluto, and there swing through time like a spiral. The relationship in rotation time is 3:2. This resonance and the relationship with the aphelium of Pluto are totally unique and do not occur elsewhere in our solar system. It is as if the ‘weight’ of Pluto increases through means of this resonance, especially when seen in terms of the accompanying dramatic events in our human history. Viewed together with the regular reoccurrence of prolonged harmonious aspects, a clear system is unravelling. In figure 1, next to the blue circles showing four of the six NE-0-PL conjunctions, a major aspect of Uranus is visible, concurrent with the constellation. The conjunction of 578 BC is at the start of a period in which too much occurred to describe here in full (see chapter 1 of The Inner power of Imagination). It was from that time that a new cultural period began, according to historians and cultural philosophers (e.g. Karl Jaspers and Henri Bamford Parkes). The incoming square of UR to the NE-PL conjunction around 410 A.D. occurred simultaneously with the destruction of Rome – the end of classical antiquity. The next NE-0-PL, around 905 A.D., was aspected harmoniously, trine to Uranus, simultaneous to the transition from the Dark Ages to the Middle Ages, i.e., to continuity. With the conjunction of 1398, in opposition to Uranus, came a reorientation towards classical antiquity and a distancing from the Middle Ages. From this it can be concluded that tense aspects between UR and NE-PL conjunctions occur simultaneously with discontinuity in the historic process. For further information about the cycles of Uranus with NE and PL see my earlier article ‘The Inner Power of the Imagination’, paragraph 4. 1. An incoming disharmonious aspect between Pluto and Neptune, or a conjunction that, because of its receptivity, is extremely vulnerable. 2. Tense (hard) incoming aspects from Uranus to Pluto and Neptune. 3. All (3) waves on the descend. (see the Fall of Rome in 410). 1. A harmonious, preferably an outgoing and prolonged aspect between Pluto and Neptune, as in our own time. 3. All the waves are in ascendence. (e.g. see the year 2026). It seems complicated and takes a while to comprehend but once these fundamental principles are understood, then the insight is clear. The years 410 A.C. and 2026 A.C. are exemplary examples of the conditions described above. It can be concluded that these extremes of catastrophe and bloom do not occur often. The constellation of the year 114 A.C. illustrates such a period of cultural fruition. Then 4 harmonious aspects occurred between the collective planets, as the Saturn and Jupiter wave began their ascending path. More constellations which almost satisfy the conditions for one of these opposing groups can be found in the overview ‘Universal History‘, here on the following page. See for example, The Golden Age of Pericles. This lasted precisely as long as the aspect NE-60-PL, within an orb of 6 degrees. Also the period led by Augustus with e.g. the initiation of the peace altar, the Ara Pacis. 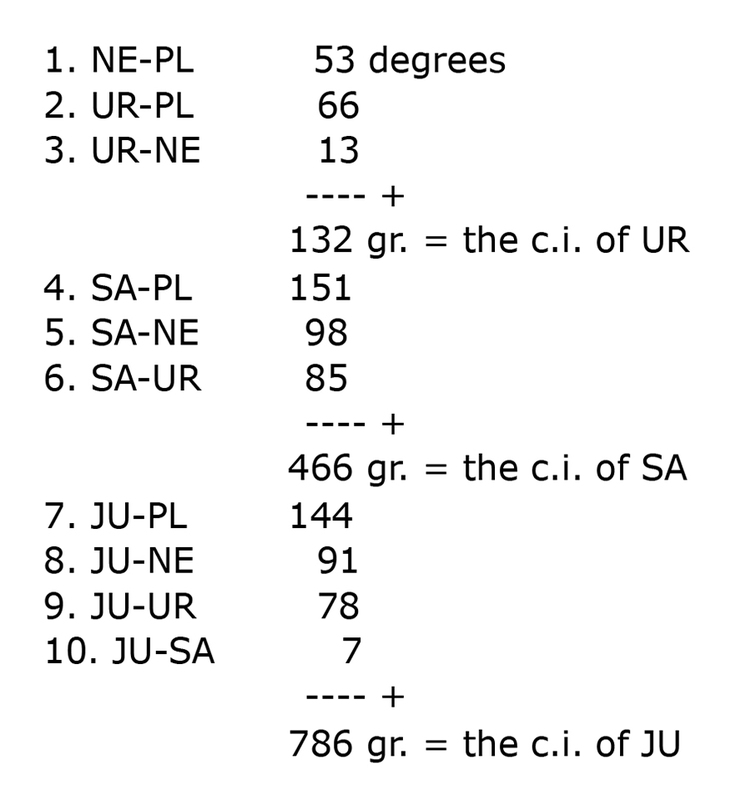 The overview on figure 4 also shows that the UR-PL and UR-NE aspects relative to Pluto repeat themselves after almost 2000 years, with opposite aspects. The great conjunction of around 577 B.C. (PL-0-NE-0-UR) finds its ‘counterpart’ around 1400 A.C. with PL-0-NE-180-UR after which a reorientation occurred in classical civilization (that began after the great conjunction of 577 B.C.) The conjunction of 410 A.C.(The Fall of Rome) was opposite to that of 2385 A.C. The incoming squares of 410 have by then become outgoing. A.C. the Uranus positions relative to Pluto and Neptune in cycles 5 to/and 8 are opposite to the cycles 1 to/and 4. It would seem like a form of ‘justice’, as if an equilibrium were reached, since all the aspects of Uranus with Neptune and Pluto occur within a period of almost 4 millennia. Plato and his classical peers would have appreciated this. Unfortunately, as Plato himself noted, the orbits of the wandering stars were not sufficiently known in those days to draw such conclusions. Leaving the collective domain of the mystery planets to look more closely into the JU- and SA-wave, we zoom in on the period 2014-2026. The JU-wave is the same as the ‘Cyclic Indication (C.I.) of de Outer Planets’ by Gouchon/Barbault. A description and history of this can be found in my article ‘Waves of Wars 1500-2000‘. There it becomes clear why I introduced the ‘sub-waves’, that is, the SA-, UR- and NE-waves. These appear to be equally as important as the Jupiter wave, yes, even fundamentally so. After all, as all the sub-waves are in the descendent phase, the ‘End of the World’ has arrived! In Barbault’s Cyclic Indication the lower waves are not visible but solely show the depth of descent. The deeper the C.I. descends, the worse society suffers, one would assume. But it is not so simple. The C.I. of Barbault (and my Jupiter Wave) are lower in 1983 and 2022 than during both World Wars. (WO I: 768∘, WO II: 583∘, 1983: 315∘ and 2022: 480∘degrees). Even so the period 1975-1983 did not lead to another world war and that is not to be expected in the period 2014-2022. The number of waves that are simultaneously in the descendant provides a more meaningful indication for the seriousness of wars which break out, than the depth of the C.I. at that moment (see Waves of Wars 1500-2000). It appears that no independent economist can answer the question as to what lies ahead for the financial world. The works of various renowned authors on this subject lead the reader to conclude that Marx was completely right about banks often deliberately setting out to pull the wool over the eyes of the population, their clients. They have the power to do so. Now they have become too mighty to fall. Moreover, anyone currently able to employ the best mathematicians and create the fastest internet connection can, in a flash, harvest millions. Such legal bands of thieves never appear in front of a camera, never mind before a judge. This is an underworld that would seem to be impossible to supervise. Our abundant Dutch pension funds, for instance, are considered ‘easy pickings’ according to an observer of the financial circuit of investor’s funds in the U.S.A., where a large part of our pension funds have been ‘accommodated’. This is a painful reality: in our capitalist economy profits have been privatized and the losses socialized, that is, are the responsibility of the taxpayer. And that is not about to change since the multinationals and the banks are more powerful than any national government. At certain times things go wrong. But when? 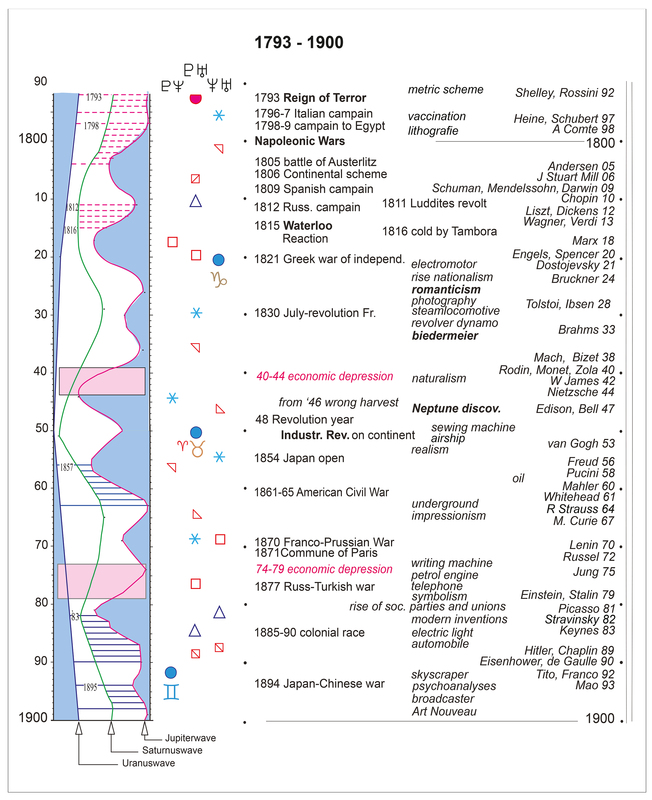 For instance, in the periods 1793-1816, 1911-1916 and 1936-1945 it was… Apocalypse! In second place on the scale of disaster are the periods in which the descending SA-wave occurs together with a descending JU-wave. In the graph of the 19th Century (fig. 6) there are 2 red rectangles which mark the duration of the the century’s two most important economic depressions. You see that these largely correspond with the concurrent descent of the two waves, this apparently having an influence on the social field, as it occurred together with serious social crises. In conclusion of this overview of the economic situation see the two graphs of the Dow Jones. The original one was published in 2004 in a reputable Dutch newspaper. At the time I was taken aback to recognize exactly the same pattern of rise and fall as in my SA-wave. Therefore I also include that graph here (see figure 7). The similarities are striking. That led me from 2004 to advise investors to quit the stock market after 2007. That was good advice, it seems. In the most recent graph I include the JU-wave and, to simplify matters visually, I show only the upward phases of the SA- and JU- wave. This is also revealing, since the graph shows that in the empty places (where support from the two rising waves is absent) the Dow Jones is at an extreme low. The sole exception to this was the First World War, which seems to have worked beneficially for the American economy. ‘One man’s death (Europe) is another man’s breath (U.S.A.)’. The three periods (respectively 1919-1926, 1956-1965 and 1996-2003) in which the SA- and JU- waves rose simultaneously are striking, too. 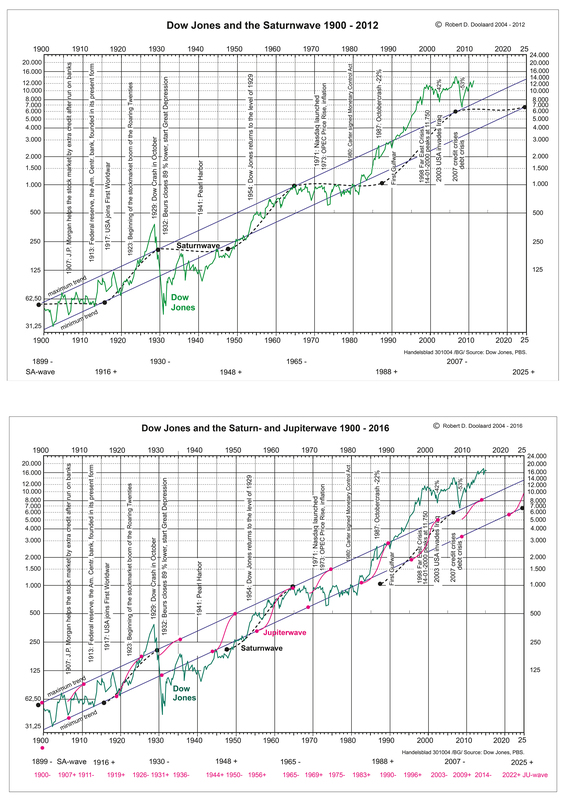 In the first period (1919-1926) shares rose from the minimum to the maximum trend. During the 2nd period this occurred again. In the 3rd period the rates rose from maximum to double the maximum. Unheard of! For a quarter of a century the Dow Jones has been floating in a bubble. The extreme financial injections it has received have elevated the patient into the heavens- without a safety net… In 2004, the year in which this graph was published, the financial editors of the newspaper were concerned about the bubble but now, 12 years on, it is no longer mentioned. A graph like this would seem to be seriously undermining to the stock-exchange. For this period let us look at the graph ‘Modern History’, figure 8. In it you can see, just as in the graph of the 19th century, two red rectangles. This time they show the whole period in which both ‘social’ waves (JU and SA) descend and we have already seen that this means society has to endure a substantial crisis. What happened during the descending JU-wave of 1975 to 1983? Above are 5 known wars, among which are 3 mega-wars. At the same time there was a serious economic crisis and panic over the environment (acid rain, dying forests, an approaching Ice Age), the time of Punk and ‘No Future’. The second red rectangle, in which the SA- and JU-wave descend simultaneously, is positioned between 2014 and 2022. In the Spring of 2014, at an Astrology conference in Soesterberg (the Netherlands) I predicted a war and an economic crisis but had no idea where that war would be. Two months later the media showed us the gruesome images of beheadings by fighters of the Islamic State (who also believe they are living in the Last Days), leading to the greatest humanitarian disaster of this century, taking place before our eyes. And it is remarkable how the ascending waves of the second half of the ’90’s of the last century coincided with a peak in European integration. Now the same waves are descending, we are faced with a period of threatening European disintegration, worsened by efforts to solve an overwhelming refugee crisis. In periods when the ‘social-political’ waves descend, any extra problems are unwelcome. We are forced to pay for the ‘sins of the past’, like the destruction of Iraq as sovereign state in 2003 by the younger Bush and Co. The resulting power vacuum gave rise to the I.S., the Arab Spring vanished from sight, as if it never happened. Moreover, in 2014 Russia annexed the Crimean peninsula and supported the separatists in East Ukraine. The relationship between Russia and the West has since deteriorated to the extent that currently people speak of a new Cold War. However, there is an essential difference in the astronomical background of the periods represented by the two red rectangles (fig. 8) , as a result of the UR-wave. After the PL-0-UR of 1965 and the NE-0-UR of 1993, this wave was in full ascendance, coming into the creative phase. When this happened before, in the second half of the 19th century, it coincided with the period of industrial revolution on the continent. Now we are also experiencing a new phase of permanent (cultural) revolution and precipitating emancipation. Slowly we are becoming aware that this is an unstoppable process, as the UR- wave, as well as the NE-wave, are in a rising, creative phase. This has not occurred since the Renaissance. Culture is spinning like a top and what can possibly stop the march of progress? Unfortunately a large part of society will be unable to keep up with the new developments. A new (populist) underclass is on the rise, which feels neglected and insecure. The domaine of Neptune and Pluto is the collective subconscious. That is problematic, since nothing or no one in particular can be held responsible. It expresses itself in attitude, sound, colour, form, language and taste, as ‘one’s heart’s desire’ and as passion for life. The domaine of Uranus is human consciousness. An 84-year revolution of Uranus through the zodiac coincides with the average expiration date of our rationally-imbued mammal sort, at least in the more developed countries. Together, these three (mysterious) heavenly bodies, in their ever-changing relationships to one another, are apparently decisive in their influence on the culture of which we are part. They inspire us to surpass ourselves. The research for my article Neptunian Explorations led to similar conclusions. In the charts of talented individuals, purveyors of culture, it appears that these three planets play an important role, in aspect with one another and in relation to the Sun. Apocalypse means: revelation, unveiling, disclosure. Planetary-cyclic historic studies are, as such, an apocalyptic affair. However, they do not reveal the end of the world, which remains unknown to us. They do show us the dynamics of change within the unity of time, space and action in the evolution of human society. This can be astronomically delineated. Taking 2000 (March 21) as an example, we begin with the cyclic index of Uranus. To achieve this the distance, in angular separation, is first calculated between Pluto and Neptune, that is, 53 degrees. To this we add the angular separations of Uranus-Pluto and Uranus-Neptune, respectively 66 and 13 degrees, obtaining a total of 132 degrees. The graph begins at 100 degrees; a point is set for Uranus at 132. To obtain the cyclic index of Saturn, the angular separations of Saturn-Pluto, Saturn-Neptune and Saturn-Uranus are added to 132. These calculations are made for each year. The points are set out on a graph. Because the term ‘cyclic index of Uranus’ etc. is rather a mouthful, I will from now on use the terms Uranus wave, Saturn wave and Jupiter wave. If you have difficulty ‘reading’ the waves in the above graphs, I would advise you turn to the graphs figure 6 and 8 and turn them round 90 degrees. Then the rises and falls are clear to see.